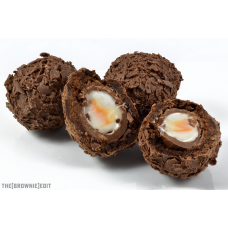 Chocolate Scotch Eggs – yes you read that right! A Cadbury Creme Egg or Caramel Egg wrapped in loads of original brownie, dipped in Belgian milk chocolate and rolled in Belgian milk chocolate flakes. Warning: Highly Addictive! Crème Egg Scotch Egg – yes you read that right! It's been a while, but Creme Eggs are now back in se..